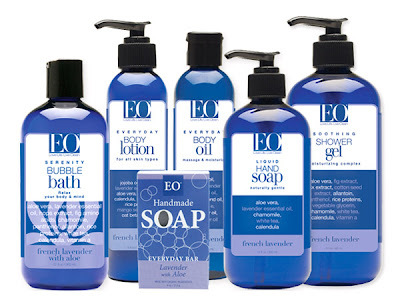 I was very lucky to be able to review the Products I received from EO. As I have said before, I love things that are clean and free of the yucky stuff that our bodies do not need. 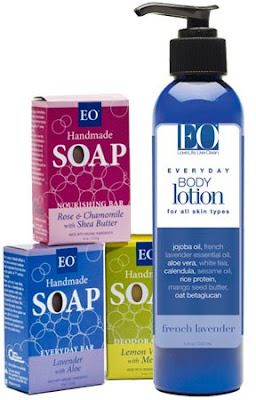 EO’s motto is Love Life, Live Clean. They are amazing products. All products are paraben free, polysorbate free, disodium EDTA free and Sodium Laureth/Lauryl Sulfate Free. My favourite is the 16 fl oz bottle of Grapefruit and Mint Shower Gel. 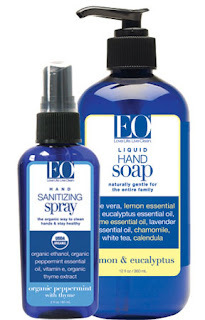 ($12.99) It gently cleanses with pure essential oils and organic herbal blends to soothe and nourish. I love the lather which sometimes you don’t get with chemical free products. The 8 fl oz bottle of Body Lotion was a nice compliment to the shower gel. It was Lemon Verbena and smells clean and crisp. ($7.64) It was quick to absorb and easy to spread leaving skin smooth and soft. Sadie and I both enjoy the coconut and vanilla with tangerine Foaming Hand Soap. ($8.99) She loved washing her hands with this and I love the smell. Its great for sensitive skin as well. The Hand Cleansing Wipes are perfect to throw in your bag while out and about of going to the gym. A 10 ct pack is only $5.99.